"Usain" redirects here. For the organization with the acronym "USAIN", see United States Agricultural Information Network. Usain St Leo Bolt OJ CD (/ˈjuːseɪn/; born 21 August 1986) is a Jamaican retired sprinter. He also is a world record holder in the 100 metres, 200 metres and 4 × 100 metres relay. His reign as Olympic Games champion in all of these events spans three Olympics. Owing to his achievements and dominance in sprint competition, he is widely considered to be the greatest sprinter of all time. A nine-time Olympic gold medalist, Bolt won the 100 m, 200 m and 4 × 100 m relay at three consecutive Olympic Games, although he lost the 2008 relay gold medal about nine years after due to a teammate's doping disqualification. He gained worldwide fame for his double sprint victory in world record times at the 2008 Beijing Olympics, which made him the first person to hold both records since fully automatic time became mandatory. Bolt is the only sprinter to win Olympic 100 m and 200 m titles at three consecutive Olympics (2008, 2012 and 2016). 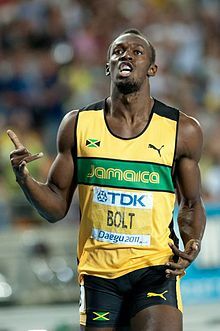 Bolt was born on 21 August 1986 to parents Wellesley and Jennifer Bolt in Sherwood Content, a small town in Jamaica. He has a brother, Sadiki, and a sister, Sherine. His parents ran the local grocery store in the rural area, and Bolt spent his time playing cricket and football in the street with his brother, later saying, "When I was young, I didn't really think about anything other than sports." As a child, Bolt attended Waldensia Primary, where he began showing his sprint potential when he ran in his parish's annual national primary school meet. By the age of twelve, Bolt had become the school's fastest runner over the 100 metres distance. Upon his entry to William Knibb Memorial High School, Bolt continued to focus on other sports, but his cricket coach noticed Bolt's speed on the pitch and urged him to try track and field events. Pablo McNeil, a former Olympic sprint athlete, and Dwayne Jarrett coached Bolt, encouraging him to focus his energy on improving his athletic abilities. The school had a history of success in athletics with past students, including sprinter Michael Green. Bolt won his first annual high school championships medal in 2001; he took the silver medal in the 200 metres with a time of 22.04 seconds. McNeil soon became his primary coach, and the two enjoyed a positive partnership, although McNeil was occasionally frustrated by Bolt's lack of dedication to his training and his penchant for practical jokes. When Bolt was a boy, he attended Sherwood Content Seventh-day Adventist Church in Trelawny, Jamaica, with his mother. His mother didn't serve pork to him in accordance with Adventist beliefs. Performing for Jamaica in his first Caribbean regional event, Bolt clocked a personal best time of 48.28 s in the 400 metres in the 2001 CARIFTA Games, winning a silver medal. The 200 m also yielded a silver, as Bolt finished in 21.81 s.
He made his first appearance on the world stage at the 2001 IAAF World Youth Championships in Debrecen, Hungary. Running in the 200 m event, he failed to qualify for the finals, but he still set a new personal best of 21.73 s. Bolt still did not take athletics or himself too seriously, however, and he took his mischievousness to new heights by hiding in the back of a van when he was supposed to be preparing for the 200 m finals at the CARIFTA Trials. He was detained by the police for his practical joke, and there was an outcry from the local community, which blamed coach McNeil for the incident. However, the controversy subsided, and both McNeil and Bolt went to the CARIFTA Games, where Bolt set championship records in the 200 m and 400 m with times of 21.12 s and 47.33 s, respectively. He continued to set records with 20.61 s and 47.12 s finishes at the Central American and Caribbean Junior Championships. Bolt is one of only nine athletes (along with Valerie Adams, Veronica Campbell-Brown, Jacques Freitag, Yelena Isinbayeva, Jana Pittman, Dani Samuels, David Storl, and Kirani James) to win world championships at the youth, junior, and senior level of an athletic event. Former Prime Minister P. J. Patterson recognised Bolt's talent and arranged for him to move to Kingston, along with Jermaine Gonzales, so he could train with the Jamaica Amateur Athletic Association (JAAA) at the University of Technology, Jamaica. The 2002 World Junior Championships were held in front of a home crowd in Kingston, Jamaica, and Bolt was given a chance to prove his credentials on a world stage. By the age of 15, he had grown to 1.96 metres (6 ft 5 in) tall, and he physically stood out among his peers. He won the 200 m in a time of 20.61 s, which was 0.03 s slower than his personal best of 20.58 s, which he set in the 1st round. Bolt's 200 m win made him the youngest world-junior gold medallist ever. The expectation from the home crowd had made him so nervous that he had put his shoes on the wrong feet. However, it turned out to be a revelatory experience for Bolt, as he vowed never again to let himself be affected by pre-race nerves. As a member of the Jamaican sprint relay team, he also took two silver medals and set national junior records in the 4×100 metres and 4×400 metres relay, running times of 39.15 s and 3:04.06 minutes respectively. The rush of medals continued as he won four golds at the 2003 CARIFTA Games and was awarded the Austin Sealy Trophy for the most outstanding athlete of the games. He won another gold at the 2003 World Youth Championships. He set a new championship record in the 200 m with a time of 20.40 s, despite a 1.1 m/s head wind. Michael Johnson, the 200 m world-record holder, took note of Bolt's potential but worried that the young sprinter might be over-pressured, stating, "It's all about what he does three, four, five years down the line". Bolt had also impressed the athletics hierarchy, and he received the IAAF Rising Star Award for 2002. Bolt competed in his final Jamaican High School Championships in 2003. He broke the 200 m and 400 m records with times of 20.25 s and 45.35 s, respectively. Bolt's runs were a significant improvement upon the previous records, beating the 200 m best by more than half a second and the 400 m record by almost a second. While Bolt improved upon the 200 m time three months later, setting the still-standing World youth best at the 2003 Pan American Junior Championships. The 400 m time remains No. 6 on the all-time youth list, surpassed only once since, by future Olympic champion Kirani James. Bolt turned his main focus to the 200 m and equalled Roy Martin's world junior record of 20.13 s at the Pan-American Junior Championships. 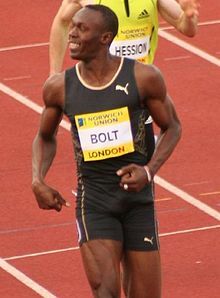 This performance attracted interest from the press, and his times in the 200 m and 400 m led to him being touted as a possible successor to Johnson. Indeed, at sixteen years old, Bolt had reached times that Johnson did not register until he was twenty, and Bolt's 200 m time was superior to Maurice Greene's season's best that year. Bolt was growing more popular in his homeland. Howard Hamilton, who was given the task of Public Defender by the government, urged the JAAA to nurture him and prevent burnout, calling Bolt "the most phenomenal sprinter ever produced by this island". His popularity and the attractions of the capital city were beginning to be a burden to the young sprinter. Bolt was increasingly unfocused on his athletic career and preferred to eat fast food, play basketball, and party in Kingston's club scene. In the absence of a disciplined lifestyle, he became ever-more reliant on his natural ability to beat his competitors on the track. Under the guidance of new coach Fitz Coleman, Bolt turned professional in 2004, beginning with the CARIFTA Games in Bermuda. He became the first junior sprinter to run the 200 m in under twenty seconds, taking the world junior record outright with a time of 19.93 s. For the second time in the role, he was awarded the Austin Sealy Trophy for the most outstanding athlete of the 2004 CARIFTA Games. A hamstring injury in May ruined Bolt's chances of competing in the 2004 World Junior Championships, but he was still chosen for the Jamaican Olympic squad. Bolt headed to the 2004 Athens Olympics with confidence and a new record on his side. However, he was hampered by a leg injury and was eliminated in the first round of the 200 metres with a disappointing time of 21.05 s. American colleges offered Bolt track scholarships to train in the United States while continuing to represent Jamaica on the international stage, but the teenager from Trelawny refused them all, stating that he was content to stay in his homeland of Jamaica. Bolt instead chose the surroundings of the University of Technology, Jamaica, as his professional training ground, staying with the university's track and weight room that had served him well in his amateur years. The year 2005 signalled a fresh start for Bolt in the form of a new coach, Glen Mills, and a new attitude toward athletics. Mills recognised Bolt's potential and aimed to cease what he considered an unprofessional approach to the sport. Bolt began training with Mills in preparation for the upcoming athletics season, partnering with more seasoned sprinters such as Kim Collins and Dwain Chambers. The year began well, and in July, he knocked more than a third of a second off the 200 m CAC Championship record with a run of 20.03 s, then registered his 200 m season's best at London's Crystal Palace, running in 19.99 s.
Misfortune awaited Bolt at the next major event, the 2005 World Championships in Helsinki. Bolt felt that both his work ethic and athleticism had much improved since the 2004 Olympics, and he saw the World Championships as a way to live up to expectations, stating, "I really want to make up for what happened in Athens. Hopefully, everything will fall into place". Bolt qualified with runs under 21 s, but he suffered an injury in the final, finishing in last place with a time of 26.27 s. Injuries were preventing him from completing a full professional athletics season, and the eighteen-year-old Bolt still had not proven his mettle in the major world-athletics competitions. However, his appearance made him the youngest ever person to appear in a 200 m world final. Bolt was involved in a car accident in November, and although he suffered only minor facial lacerations, his training schedule was further upset. His manager, Norman Peart, made Bolt's training less intensive, and he had fully recuperated the following week. Bolt had continued to improve his performances, and he reached the world top-5 rankings in 2005 and 2006. Peart and Mills stated their intentions to push Bolt to do longer sprinting distances with the aim of making the 400 m event his primary event by 2007 or 2008. Bolt was less enthusiastic, and demanded that he feel comfortable in his sprinting. He suffered another hamstring injury in March 2006, forcing him to withdraw from the 2006 Commonwealth Games in Melbourne, and he did not return to track events until May. After his recovery, Bolt was given new training exercises to improve flexibility, and the plans to move him up to the 400 m event were put on hold. The 200 m remained Bolt's primary event when he returned to competition; he bested Justin Gatlin's meet record in Ostrava, Czech Republic. Bolt had aspired to run under twenty seconds to claim a season's best but, despite the fact that bad weather had impaired his run, he was happy to end the meeting with just the victory. However, a sub-20-second finish was soon his, as he set a new personal best of 19.88 s at the 2006 Athletissima Grand Prix in Lausanne, Switzerland, finishing behind Xavier Carter and Tyson Gay to earn a bronze medal. Bolt had focused his athletics aims, stating that 2006 was a year to gain experience. Also, he was more keen on competing over longer distances, setting his sights on running regularly in both 200 m and 400 m events within the next two years. Bolt claimed his first major world medal two months later at the IAAF World Athletics Final in Stuttgart, Germany. He passed the finishing post with a time of 20.10 s, gaining a bronze medal in the process. The IAAF World Cup in Athens, Greece, yielded Bolt's first senior international silver medal. Wallace Spearmon from the United States won gold with a championship record time of 19.87 s, beating Bolt's respectable time of 19.96 s. Further 200 m honours on both the regional and international stages awaited Bolt in 2007. He yearned to run in the 100 metres but Mills was skeptical, believing that Bolt was better suited for middle distances. The coach cited the runner's difficulty in smoothly starting out of the blocks and poor habits such as looking back at opponents in sprints. Mills told Bolt that he could run the shorter distance if he broke the 200 m national record. In the Jamaican Championships, he ran 19.75 s in the 200 m, breaking the 36-year-old Jamaican record held by Don Quarrie by 0.11 s.
Mills complied with Bolt's demand to run in the 100 m, and he was entered to run the event at the 23rd Vardinoyiannia meeting in Rethymno, Crete. In his debut tournament run, he set a personal best of 10.03 s, winning the gold medal and feeding his enthusiasm for the event. He built on this achievement at the 2007 World Championships in Osaka, Japan, winning a silver medal. Bolt recorded 19.91 s with a headwind of 0.8 m/s. The race was won by Tyson Gay in 19.76 s, a new championship record. Bolt was a member of the silver medal relay team with Asafa Powell, Marvin Anderson, and Nesta Carter in the 4×100 metres relay. Jamaica set a national record of 37.89 s. Bolt did not win any gold medals at the major tournaments in 2007, but Mills felt that Bolt's technique was much improved, pinpointing improvements in Bolt's balance at the turns over 200 m and an increase in his stride frequency, giving him more driving power on the track. The silver medals from the 2007 Osaka World Championships boosted Bolt's desire to sprint, and he took a more serious, more mature stance towards his career. Bolt continued to develop in the 100 m, and he decided to compete in the event at the Jamaica Invitational in Kingston. On 3 May 2008, Bolt ran a time of 9.76 s, with a 1.8 m/s tail wind, improving his personal best from 10.03 s. This was the second-fastest legal performance in the history of the event, second only to compatriot Asafa Powell's 9.74 s record set the previous year in Rieti, Italy. Rival Tyson Gay lauded the performance, especially praising Bolt's form and technique. 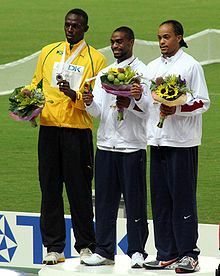 Michael Johnson observed the race and said that he was shocked at how quickly Bolt had improved over the 100 m distance. The Jamaican surprised even himself with the time, but coach Glen Mills remained confident that there was more to come. On 31 May 2008, Bolt set a new 100m world record at the Reebok Grand Prix in the Icahn Stadium in New York City. He ran 9.72s with a tail wind of 1.7 m/s. This race was Bolt's fifth senior 100 m. Gay again finished second and said of Bolt: "It looked like his knees were going past my face." 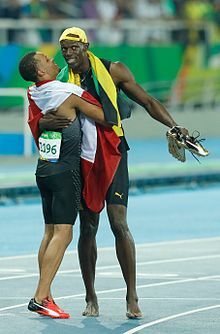 Commentators noted that Bolt appeared to have gained a psychological advantage over fellow Olympic contender Gay. In June 2008, Bolt responded to claims that he was a lazy athlete, saying that the comments were unjustified, and he trained hard to achieve his potential. However, he surmised that such comments stemmed from his lack of enthusiasm for the 400 metres event; he chose not to make an effort to train for that particular distance. Turning his efforts to the 200 m, Bolt proved that he could excel in two events—first setting the world-leading time in Ostrava, then breaking the national record for the second time with a 19.67 s finish in Athens, Greece. Although Mills still preferred that Bolt focus on the longer distances, the acceptance of Bolt's demand to run in the 100 m worked for both sprinter and trainer. Bolt was more focused in practice, and a training schedule to boost his top speed and his stamina, in preparation for the Olympics, had improved both his 100 m and 200 m times. Bolt announced that he would double-up with the 100 metres and 200 metres events at the Beijing Summer Olympics. As the new 100 m world-record holder, he was the favourite to win both races. Michael Johnson, the 200 m and 400 m record holder, personally backed the sprinter, saying that he did not believe that a lack of experience would work against him. Bolt qualified for the 100 m final with times of 9.92 s and 9.85 s in the quarter-finals and semi-finals, respectively. "And a fair start, Asafa Powell, Usain Bolt is also out well. Here they come down the track. USAIN BOLT! SPRINTING AHEAD, WINNING BY DAYLIGHT!" —Tom Hammond, NBC Sports, with the call for the men's 100 metres final at the 2008 Summer Olympics. In the Olympic 100 m final, Bolt broke new ground, winning in 9.69 s (unofficially 9.683 s) with a reaction time of 0.165 s. This was an improvement upon his own world record, and he was well ahead of second-place finisher Richard Thompson, who finished in 9.89 s. Not only was the record set without a favourable wind (+0.0 m/s), but he also visibly slowed down to celebrate before he finished and his shoelace was untied. Bolt's coach reported that, based upon the speed of Bolt's opening 60 m, he could have finished with a time of 9.52 s. After scientific analysis of Bolt's run by the Institute of Theoretical Astrophysics at the University of Oslo, Hans Eriksen and his colleagues also predicted a sub 9.60 s time. 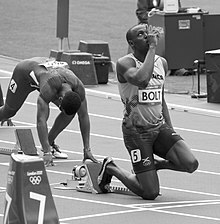 Considering factors such as Bolt's position, acceleration and velocity in comparison with second-place-finisher Thompson, the team estimated that Bolt could have finished in 9.55±0.04 s had he not slowed to celebrate before the finishing line. Bolt stated that setting a world record was not a priority for him, and that his goal was just to win the gold medal, Jamaica's first of the 2008 Games. Olympic medallist Kriss Akabusi construed Bolt's chest slapping before the finish line as showboating, noting that the actions cost Bolt an even faster record time. IOC president Jacques Rogge also condemned the Jamaican's actions as disrespectful. Bolt denied that this was the purpose of his celebration by saying, "I wasn't bragging. When I saw I wasn't covered, I was just happy". Lamine Diack, president of the IAAF, supported Bolt and said that his celebration was appropriate given the circumstances of his victory. Jamaican government minister Edmund Bartlett also defended Bolt's actions, stating, "We have to see it in the glory of their moment and give it to them. We have to allow the personality of youth to express itself". Bolt then focused on attaining a gold medal in the 200 m event, aiming to emulate Carl Lewis' double win in the 1984 Los Angeles Olympics. Michael Johnson felt that Bolt would easily win gold but believed that his own world record of 19.32 s set at the 1996 Summer Olympics in Atlanta would remain intact at the Olympics. Bolt eased through the first and second rounds of the 200 m, jogging towards the end of his run both times. He won his semi-final and progressed to the final as the favourite to win. Retired Jamaican sprinter Don Quarrie praised Bolt, saying he was confident that Johnson's record could be beaten. The following day, at the final, he won Jamaica's fourth gold of the Games, setting a new world and Olympic record of 19.30 s. Johnson's record fell despite the fact that Bolt was impeded by a 0.9 m/s headwind. The feat made him the first sprinter since Quarrie to hold both 100 m and 200 m world records simultaneously and the first to hold both records since the introduction of electronic timing. Furthermore, Bolt became the first sprinter to break both records at the same Olympics. Unlike in the 100 m final, Bolt sprinted hard all the way to the finishing line in the 200 m race, even dipping his chest to improve his time. Following the race, "Happy Birthday" was played over the stadium's sound system as his 22nd birthday would begin at midnight. Two days later, Bolt ran as the third leg in the Jamaican 4 × 100 metres relay team, increasing his gold medal total to three. Along with teammates Nesta Carter, Michael Frater, and Asafa Powell, Bolt broke another world and Olympic record, their 37.10 s finish breaking the previous record by three-tenths of a second. Powell, who anchored the team to the finishing line, lamented the loss of his 100 m record to Bolt but showed no animosity towards his Jamaican rival, stating that he was delighted to help him set his third world record. In January 2017 the Jamaican relay team were stripped of their gold medals after a blood sample taken from Nesta Carter – one of Bolt's teammates in the relay – after the race, was tested again nine years later and tested positive for a banned substance. Following his victories, Bolt donated US$50,000 to the children of Sichuan province in China to help those harmed by the 2008 Sichuan earthquake. Bolt's record-setting runs caused commentators not only to praise his achievements but also to speculate about his potential to become one of the most successful sprinters ever. Critics hailed his Olympic success as a new beginning for a sport that had long suffered through high-profile drug scandals. The previous six years had seen the BALCO scandal, Tim Montgomery and Justin Gatlin stripped of their 100 m world records, and Marion Jones returning three Olympic gold medals. All three sprinters were disqualified from athletics after drugs tests detected banned substances in their systems. Bolt's record-breaking performances caused suspicion among some commentators, including Victor Conte, and the lack of an independent Caribbean anti-doping federation raised more concerns. The accusations of drug use were vehemently rejected by Glen Mills (Bolt's coach) and Herb Elliott (the Jamaican athletics team doctor). Elliott, a member of the IAAF anti-doping commission, urged those concerned about the issue to "come down and see our programme, come down and see our testing, we have nothing to hide". Mills had been equally ardent that Bolt was a clean athlete, declaring to the Jamaica Gleaner: "We will test any time, any day, any part of the body...[he] doesn't even like to take vitamins". Bolt stated that he had been tested four times prior to the Olympics, and all had tested negative for banned substances. He also welcomed anti-doping authorities to test him to prove that he was clean, stating, "We work hard and we perform well and we know we're clean". I was slowing down long before the finish and wasn't tired at all. I could have gone back to the start and done it all over again. At the end of the 2008 athletics season, Bolt competed in the ÅF Golden League, beginning in Weltklasse Zürich. Despite having the slowest start among his competitors in the 100 m race, he still crossed the finishing line in 9.83 s. Even though the time was slower than both his newly set world record and Asafa Powell's track record, it was still among the top-fifteen 100 m finishes by any sprinter to that date. Bolt admitted that he was not running at full strength because he was suffering from a cold, but he concentrated on winning the race and finishing the season in good health. At the Super Grand Prix final in Lausanne, Bolt ran his second-fastest 200 m with a time of 19.63 s, equalling Xavier Carter's track record. However, it was the 100 m final, featuring Asafa Powell, that drew the most interest. Powell had moved closer to Bolt's world record after setting a new personal best of 9.72 s, reaffirming his status as Bolt's main contender. Bolt's final event of the season came three days later at the Golden League final in Brussels. This was the first 100 m race featuring both Bolt and Powell since the final in the Olympics. Both Jamaicans broke the track record, but Bolt came out on top with a time of 9.77 s, beating Powell by 0.06 s. Victory, however, did not come as smoothly as it had in Beijing. Bolt made the slowest start of the nine competitors and had to recover ground in cold conditions and against a 0.9 m/s headwind. Yet the results confirmed Jamaican dominance in the 100 m, with nine of the ten-fastest legal times in history being recorded by either Bolt or Powell. On his return to Jamaica, Bolt was honoured in a homecoming celebration and received an Order of Distinction in recognition of his achievements at the Olympics. Additionally, Bolt was selected as the IAAF Male Athlete of the year, won a Special Olympic Award for his performances, and was named Laureus World Sportsman of the Year. Bolt turned his attention to future events, suggesting that he could aim to break the 400 metres world record in 2010 as no major championships were scheduled that year. Bolt started the season competing in the 400 metres in order to improve his speed, winning two races and registering 45.54 s in Kingston, and windy conditions gave him his first sub-10 seconds finish of the season in the 100 m in March. In late April Bolt, suffered minor leg injuries in a car crash. However, he quickly recovered following minor surgery and (after cancelling a track meet in Jamaica) he stated that he was fit to compete in the 150 metres street race at the Manchester Great City Games. Bolt won the race in 14.35 s, the fastest time ever recorded for 150 m. Despite not being at full fitness, he took the 100 and 200 m titles at the Jamaican national championships, with runs of 9.86 s and 20.25 s respectively. This meant he had qualified for both events at the 2009 World Championships. Rival Tyson Gay suggested that Bolt's 100 m record was within his grasp, but Bolt dismissed the claim and instead noted that he was more interested in Asafa Powell's return from injury. Bolt defied unfavourable conditions at the Athletissima meet in July, running 19.59 seconds into a 0.9 m/s headwind and rain, to record the fourth fastest time ever over 200 m, one hundredth off Gay's best time. Bolt beating Tyson Gay and setting a 100 m world record at the 2009 World Championships in Athletics in Berlin. The 2009 World Championships were held during August at the Olympic Stadium in Berlin, which was coincidentally the same month and venue where Jesse Owens had achieved world-wide fame 73 years earlier. Bolt eased through the 100-m heats, clocking the fastest ever pre-final performance of 9.89 seconds. The final was the first time that Bolt and Gay had met during the season, and Bolt set a new world record—which stands to this day—with a time of 9.58s to win his first World Championship gold medal. Bolt took more than a tenth of a second off his previous best mark, and this was the largest-ever margin of improvement in the 100-m world record since the beginning of electronic timing. Gay finished with a time of 9.71 s, 0.02 s off Bolt's 9.69 s world-record run in Beijing. Although Gay withdrew from the second race of the competition, Bolt once again produced world record-breaking time in the 200 metres final. He broke his own record by 0.11 seconds, finishing with a time of 19.19 seconds. He won the 200 m race by the largest margin in World Championships history, even though the race had three other athletes running under 19.90 seconds, the greatest number ever in the event. Bolt's pace impressed even the more experienced of his competitors; third-placed Wallace Spearmon complimented his speed, and the Olympic champion in Athens 2004 Shawn Crawford said "Just coming out there...I felt like I was in a video game, that guy was moving – fast". Bolt pointed out that an important factor in his performance at the World Championships was his improved start to the races: his reaction times in the 100 m (0.146) and 200 m (0.133) were significantly faster than those he had produced in his world record runs at the Beijing Olympics. However, he, together with other members of Jamaican 4×100 m relay team, fell short of their own world record of 37.10 s set at 2008 Summer Olympics by timing 37.31 s, which is, however, a championship record and the second fastest time in history at that date. Michael Frater, Bolt, and Asafa Powell after winning the 4×100 m relay. Steve Mullings is missing from the picture. On the last day of the Berlin Championships, the Governing Mayor of Berlin, Klaus Wowereit, presented Bolt with a 12-foot high section of the Berlin Wall in a small ceremony, saying Bolt had shown that "one can tear down walls that had been considered as insurmountable." The nearly three-ton segment was delivered to the Jamaica Military Museum in Kingston. Several days after Bolt broke the world records in 100 and 200 metres events, Mike Powell, the world record holder in long jump (8.95 metres set in 1991) argued that Bolt could become the first man to jump over 9 metres, the long jump event being "a perfect fit for his speed and height". At the end of the season, he was selected as the IAAF World Athlete of the Year for the second year running. Early on in the 2010 outdoor season, Bolt ran 19.56 seconds in the 200 m in Kingston, Jamaica for the fourth-fastest run of all-time, although he stated that he had no record breaking ambitions for the forthcoming season. He took to the international circuit May with wins in East Asia at the Colorful Daegu Pre-Championships Meeting and then a comfortable win in his 2010 IAAF Diamond League debut at the Shanghai Golden Grand Prix. Bolt made an attempt to break Michael Johnson's best time over the rarely competed 300 metres event at the Golden Spike meeting in Ostrava. He failed to match Johnson's ten-year-old record of 30.85 and suffered a setback in that his 30.97-second run in wet weather had left him with an Achilles tendon problem. After his return from injury a month later, Bolt asserted himself with a 100 m win at the Athletissima meeting in Lausanne (9.82 seconds) and a victory over Asafa Powell at Meeting Areva in Paris (9.84 seconds). Despite this run of form, he suffered only the second loss of his career in a 100 m final at the DN Galan. Tyson Gay soundly defeated him with a run of 9.84 to Bolt's 9.97 seconds, and the Jamaican reflected that he had slacked off in training early in the season while Gay had been better prepared and in a better condition. This marked Bolt's first loss to Gay in the 100 m, which coincidentally occurred in the same stadium where Powell had beaten Bolt for the first time two years earlier. Bolt went undefeated over 100 m and 200 m in the 2011 season. He began with wins in Rome and Ostrava in May. He ran his first 200 m in over a year in Oslo that June and his time of 19.86 seconds was a world-leading one. Two further 200 m wins came in Paris and Stockholm the following month, as did a 100 m in Monaco, though he was a tenth of a second slower than compatriot Asafa Powell before the world championships. Considered the favourite to win in the 100 metres at the 2011 World Championships in Daegu, Bolt was eliminated from the final, breaking "ridiculously early" according to the starter in an interview for BBC Sport, and receiving a false start. This proved to be the highest profile disqualification for a false start since the IAAF changed the rules that previously allowed one false start per race. The disqualification caused some to question the new rule, with former world champion Kim Collins saying it was "a sad night for athletics". Usain Bolt's countryman, Yohan Blake, won in a comparatively slow 9.92 seconds. In the World Championships 200 m, Bolt cruised through to the final which he won in a time of 19.40. Though this was short of his world record times of the two previous major tournaments, it was the fourth fastest run ever at that point, after his own records and Michael Johnson's former record, and left him three tenths of a second ahead of runner-up Walter Dix. This achievement made Bolt one of only two men to win consecutive 200 m world titles, alongside Calvin Smith. Bolt closed the championships with another gold with Jamaica in the 4 × 100 metres relay. Nesta Carter and Michael Frater joined world champions Bolt and Blake to set a world record time of 37.04. Following the World Championships, Bolt ran 9.85 seconds for the 100 m to win in Zagreb before setting the year's best time of 9.76 seconds at the Memorial Van Damme. This run was overshadowed by Jamaican rival Blake's unexpected run of 19.26 seconds in the 200 m at the same meeting, which brought him within seven hundredths of Bolt's world record. Although Bolt failed to win the Diamond Race in a specific event, he was not beaten on the 2011 IAAF Diamond League circuit, taking three wins in each of his specialities that year. Bolt began the 2012 season with a leading 100 m time of 9.82 seconds in May. He defeated Asafa Powell with runs of 9.76 seconds in Rome and 9.79 in Oslo. At the Jamaican Athletics Championships, he lost to Yohan Blake, first in the 200 m and then in the 100 m, with his younger rival setting leading times for the year. However, at the 2012 London Olympics, he won the 100 metres gold medal with a time of 9.63 seconds, improving upon his own Olympic record and duplicating his gold medal from the 2008 Beijing Olympics. Blake was the silver medallist with a time of 9.75 seconds. Following the race, seventh-place finisher Richard Thompson of Trinidad and Tobago declared "There's no doubt he's the greatest sprinter of all time", while USA Today referred to Bolt as a Jamaican "national hero", noting that his victory came just hours before Jamaica was to celebrate the 50th anniversary of its independence from the United Kingdom. With his 2012 win, Bolt became the first man to successfully defend an Olympic sprint title since Carl Lewis in 1988. I'm now a legend. I'm also the greatest athlete to live. Bolt followed this up with a successful defence of his Olympic 200 metres title with a time of 19.32 seconds, followed by Blake at 19.44 and Warren Weir at 19.84 to complete a Jamaican podium sweep. With this, Bolt became the first man in history to defend both the 100 m and 200 m Olympic sprint titles. He was dramatic in victory: in the final metres of the 200 m race, Bolt placed his fingers on his lips, gesturing to silence his critics, and after crossing the line he completed five push-ups – one for each of his Olympic gold medals. On the final day of the 2012 Olympic athletics, Bolt participated in Jamaica's gold medal-winning 4×100 metres relay team along with Nesta Carter, Michael Frater and Blake. With a time of 36.84 seconds, they knocked two tenths of a second from their previous world record from 2011. He celebrated by imitating the "Mobot" celebration of Mo Farah, who had claimed a long-distance track double for the host nation. International Olympic Committee (IOC) President Jacques Rogge initially stated that Bolt was not yet a "legend" and would not deserve such acclaim until the end of his career, but later called him the best sprinter of all time. Following the Olympics he was confirmed as the highest earning track and field athlete in history. Bolt ended his season with wins on the 2012 IAAF Diamond League circuit; he had 200 m wins of 19.58 and 19.66 in Lausanne and Zürich before closing with a 100 m of 9.86 in Brussels. The latter run brought him his first Diamond League title in the 100 m.
Bolt failed to record below 10 seconds early season and had his first major 100 m race of 2013 at the Golden Gala in June. He was served an unexpected defeat by Justin Gatlin, with the American winning 9.94 to Bolt's 9.95. Bolt denied the loss was due to a hamstring issue he had early that year and Gatlin responded: "I don't know how many people have beaten Bolt but it's an honour". With Yohan Blake injured, Bolt won the Jamaican 100 m title ahead of Kemar Bailey-Cole and skipped the 200 m, which was won by Warren Weir. Prior to the 2013 World Championships in Athletics, Bolt set world leading times in the sprints, with 9.85 for the 100 m at the London Anniversary Games and 19.73 for the 200 m in Paris. Bolt regained the title as world's fastest man by winning the World Championships 100 metres in Moscow. In wet conditions, he edged Gatlin by eight hundredths of a second with 9.77, which was the fastest run that year. Gatlin was the sole non-Jamaican in the top five, with Nesta Carter, Nickel Ashmeade and Bailey-Cole finishing next. Bolt was less challenged in the 200 m final. His closest rival was Jamaican champion Warren Weir but Bolt ran a time of 19.66 to finish over a tenth of a second clear. This performance made Bolt the first man in the history of the 200 metres at the World Championships in Athletics to win three gold medals over the distance. Bolt won a third consecutive world relay gold medal in the 4 × 100 metres relay final, which made him the most successful athlete in the 30-year history of the world championships. The Jamaican team, featuring four of the top five from the 100 m final were comfortable winners with Bolt reaching the finish line on his anchor leg three tenths of a second ahead of the American team anchored by Gatlin. Bolt's performances were matched on the women's side by Shelly-Ann Fraser-Pryce, meaning Jamaica took a complete sweep of the sprint medals at the 2013 World Championships. After the championships, Bolt took 100 m wins on the 2013 IAAF Diamond League circuit in Zürich and Brussels. He remained unbeaten in the 200 m and his only loss that year was to Gatlin over 100 m in Rome. For the fifth time in six years, Bolt was named IAAF World Male Athlete of the Year. An injury to Bolt's hamstring in March 2014 caused him to miss nine weeks of training. Having recovered from surgery, Bolt competed in the 4 × 100 metres relay of the 2014 Commonwealth Games in Glasgow. 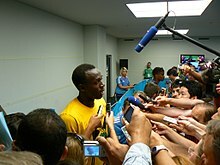 Not in peak form Bolt said that he was attending the Games for the fans and to show his progress since the injury. Bolt and his teammates won the 4 × 100 metres relay in 37.58 seconds – a Commonwealth Games record. This was the foremost competition of the year for Bolt, given no Olympics or World Championships in 2014. In August 2014, Bolt set the indoor 100 m world record in Warsaw with a time of 9.98 seconds. This was his sole individual outing of the 2014 season. Soon afterwards he ended his season early in order to be fit for the 2015 season. In Bolt's absence, Justin Gatlin had dominated the sprints, holding the year's fastest times, including seven of the top ten 100 m runs that season. At the start of 2015, he announced that he intended to make the 2017 World Championships in Athletics his last major competition before retirement. Upon his return from injury, Bolt appeared a reduced figure at the start of the 2015 season. He ran only two 100 m and three 200 m before the major championship. He opened with 10.12 seconds for the 100 m and 20.20 for the 200 m. He won the 200 m in New York and Ostrava, but his season's best time of 20.13 seconds ranked him 20th in the world going into the championships. Two 100 m runs of 9.87 in July in London showed better form, but in comparison, Justin Gatlin was easily the top ranked sprinter – the American had times of 9.74 and 19.57 seconds, and had already run under 9.8 seconds on four occasions that season. Bolt entered the World Championships to defend his sprint titles but was not the comfortable favourite he had been since 2008. In the World Championships 100 m, Bolt won his semi-final in 9.96, which lagged Gatlin's semi-final win in 9.77 seconds. However, Gatlin did not match that form in the final while Bolt improved through the rounds. In a narrow victory, Bolt leaned at the line to beat Gatlin 9.79 to 9.80 seconds. Bolt joined Carl Lewis and Maurice Greene on a record three 100 m world titles. A similar outcome followed in the 200 m World finals. In the semi-final, Gatlin outpaced Bolt – the Jamaican at 19.95 and the American at 19.87. Despite such slow times prior to Beijing, Bolt delivered in the final with his fifth fastest run ever for the 200 m at 19.55 seconds. Gatlin failed to reach his early season form and finished almost two-tenths of a second behind Bolt. Bolt's four consecutive wins over 200 m at the World Championships was unprecedented and established him clearly as the best ever sprinter at the competition. There was also a fourth straight win in the 4 × 100 metres relay with the Jamaica team (Nesta Carter, Asafa Powell, Nickel Ashmeade, Usain Bolt). The Americans initially had a lead, but a poor baton exchange saw them disqualified and Jamaica defend their title in 37.36 seconds – well clear of the Chinese team who took a surprise silver for the host nation. Conscious of his injuries at the start of the season, he did not compete after the World Championships, skipping the 2015 IAAF Diamond League final. Andre De Grasse and Bolt after running the 100 m final at the 2016 Olympics. Bolt competed sparingly in the 200 m before the Olympics, with a run of 19.89 seconds to win at the London Grand Prix being his sole run of note over that distance. He had four races over 100 m, though only one was in Europe, and his best of 9.88 seconds in Kingston placed him fourth on the world seasonal rankings. As in the previous season, Gatlin appeared to be in better form, having seasonal bests of 9.80 and 19.75 seconds to rank first and second in the sprints. Doping in athletics was a prime topic before the 2016 Rio Olympics, given the banning of the Russian track and field team for state doping, and Bolt commented that he had no problem with doping controls: "I have no issue with being drug-tested...I remember in Beijing every other day they were drug-testing us". He also highlighted his dislike of rival Tyson Gay's reduced ban for cooperation, given their close rivalry since the start of Bolt's career, saying "it really bothered me – really, really bothered me". I want to be among greats Muhammad Ali and Pelé. —  Usain Bolt on his sporting legacy prior to his final Olympics, 9 August 2016. At the 2016 Rio Olympics, Bolt won the 100 metres gold medal with a time of 9.81 seconds. With this win, Bolt became the first athlete to win the event three times at the Olympic Games. Bolt followed up his 100 m win with a gold medal in the 200 m, which also makes him the first athlete to win the 200 m three times at the Olympic Games. Bolt ran the anchor leg for the finals of the 4 × 100 m relay and secured his third consecutive and last Olympic gold medal in the event. With that win, Bolt obtained the "triple-triple", three sprinting gold medals in three consecutive Olympics, and finished his Olympic career with a 100% win record in finals. However, in January 2017, Bolt was stripped of the 4 × 100 relay gold from the Beijing Games in 2008 because his teammate Nesta Carter was found guilty of a doping violation. Bolt took a financial stake in a new Australia-based track and field meeting series – Nitro Athletics. He performed at the inaugural meet in February 2017 and led his team (Bolt All-Stars) to victory. The competition featured variations on traditional track and field events. He committed himself to three further editions. In 2017, the Jamaican team was stripped of the 2008 Olympics 4×100 metre title due to Nesta Carter's disqualification for doping offences. Bolt, who never failed a dope test, was quoted by the BBC saying that the prospect of having to return the gold was "heartbreaking". The banned substance in Carter's test was identified as methylhexanamine, a nasal decongestant sometimes used in dietary supplements. At the 2017 World Athletics Championships, Bolt won his heat uncomfortably after a slow start in 10.07, in his semi-final he improved to 9.98 but was beaten by Christian Coleman by 0.01. That race broke Bolt's 4 year winning streak in the 100m. In his final individual race, in the final, Bolt won the Bronze medal in 9.95, 0.01 behind Silver medalist Coleman and 0.03 behind World Champion Justin Gatlin. It was the first time Bolt had been beaten at a major championship since the 4×100 m relay of the 2007 World Athletics Championships. Also at the 2017 World Athletics Championships, Bolt participated as the anchor runner for Jamaica's 4×100-metre relay team in both the heats and the final. Jamaica won their heat comfortably in 37.95 seconds. In what was intended to be his final race, Bolt pulled up in agony with 50 metres to go and collapsed to the track after what was later confirmed to be another hamstring injury. He refused a wheelchair and crossed the finish line one last time with the assistance of his teammates Omar McLeod, Julian Forte, and Yohan Blake. In an interview with Decca Aitkenhead of The Guardian in November 2016, Bolt said he wished to play as a professional footballer after retiring from athletics. He reiterated his desire to play for Manchester United if given a chance and added, "For me, if I could get to play for Manchester United, that would be like a dream come true. Yes, that would be epic". In 2018, after training with Norwegian side Strømsgodset, Bolt played for the club as a forward in a friendly match against the Norway national under-19 team. He wore the number "9.58" in allusion to his 100 m world record. Bolt wore the same number whilst captaining the World XI during Soccer Aid 2018 at Old Trafford. On 21 August 2018, on his 32nd birthday, Bolt started training with Australian club Central Coast Mariners of the A-League. He made his friendly debut for the club as a substitute on 31 August 2018 against a Central Coast Select team, made up of players playing in the local area. On 12 October, he started in a friendly against amateur club Macarthur South West United and scored two goals, both in the second half, with his goal celebration featuring his signature “To Di World” pose. Bolt was offered a two-year contract from Maltese club Valletta, which he turned down on 18 October 2018. On 21 October 2018, Bolt was offered a contract by the Mariners. The Australian FA was helping the Mariners to fund it. Later that month, Perth Glory forward Andy Keogh was critical of Bolt's ability, stating his first touch is "like a trampoline". He added Bolt has "shown a bit of potential but it's a little bit of a kick in the teeth to the professionals that are in the league." Bolt left the Mariners in early November 2018 after 8 weeks with the club. In January 2019, Bolt announced his retirement from football, saying his "sports life was over". Bolt expresses a love for dancing and his character is frequently described as laid-back and relaxed. His Jamaican track and field idols include Herb McKenley and former Jamaican 100m and 200m world record holder, Don Quarrie. Michael Johnson, the former 200 m world and Olympic record holder, is also held in high esteem by Bolt. Bolt has the nickname "Lightning Bolt" due to his name and speed. He is Catholic and known for making the sign of the cross before racing competitively, and he wears a Miraculous Medal during his races. His middle name is St. Leo. In 2010, Bolt also revealed his fondness of music, when he played a reggae DJ set to a crowd in Paris. He is also an avid fan of the Call of Duty video game series, saying, "I stay up late [playing the game online], I can't help it." In his autobiography, Bolt reveals that he has suffered from scoliosis, a condition that has curved his spine to the right and has made his right leg half an inch shorter than his left. He popularised the "lightning bolt" pose, also known as "to di world" or "bolting", which he used both before races and in celebration. The pose consists of extending a slightly raised left arm to the side and the right arm folded across the chest, with both hands have the thumb and index finger outstretched. His performance of the pose during his Olympic and World Championship victories led to widespread copying of the move, from American President Barack Obama to small children. It has been suggested that the pose comes from Jamaican dancehall moves of the period, though Olympic sprint champion Bernard Williams also had performed similar celebration moves earlier that decade. Cricket was the first sport to interest Bolt, and he said if he were not a sprinter, he would be a fast bowler instead. As a child, he was a supporter of the Pakistani cricket team and admired the bowling of Waqar Younis. He is also a fan of Indian batsman Sachin Tendulkar, West Indian opener Chris Gayle, and Australian opener Matthew Hayden. During a charity cricket match, Bolt clean-bowled Gayle who was complimentary of Bolt's pace and swing. Bolt also struck a six off Gayle's bowling. Another bowler complimentary of Bolt's pace was former West Indies fast-bowling great Curtly Ambrose. After talking with Australian cricketer Shane Warne, Bolt suggested that if he were able to get time off he would be interested in playing in the cricket Big Bash League. Melbourne Stars chief executive Clint Cooper said there were free spots on his team should be available. Bolt stated that he enjoyed the Twenty20 version of the game, admiring the aggressive and constant nature of the batting. On his own ability, he said "I don't know how good I am. I will probably have to get a lot of practice in." Bolt is also a fan of Premier League football team Manchester United. He has declared he is a fan of Dutch striker Ruud van Nistelrooy. Bolt was a special guest of Manchester United at the 2011 UEFA Champions League Final in London, where he stated that he would like to play for them after his retirement. In 2013, Bolt played basketball in the NBA All-Star Weekend Celebrity Game. He scored two points from a slam dunk but acknowledged his other basketball skills were lacking. A biographical film based on the athletic life of Bolt to win three Olympic gold medals, titled I Am Bolt, was released on 28 November 2016 in United Kingdom. The film was directed by Benjamin Turner and Gabe Turner. Almost single-handedly, Bolt has helped track transform itself from a dying sport to one with a singular, smiling, worldwide star. In September 2010, Bolt travelled to Australia where his sponsor Gatorade was holding an event called the "Gatorade Bolt" to find Australia's fastest footballer. The event was held at the Sydney International Athletic Centre and featured football players from rugby league, rugby union, Australian rules football, and association football. Prior to the race Bolt gave the runners some private coaching and also participated in the 10th anniversary celebrations for the 2000 Summer Olympic Games. In January 2012, Bolt impersonated Richard Branson in an advertising campaign for Virgin Media. The campaign was directed by Seth Gordon and features the Virgin founder Branson to promote its broadband service. In March 2012, Bolt starred in an advert for Visa and the 2012 Summer Olympics. In July 2012, Bolt and RockLive launched Bolt!, an Apple iOS game based on his exploits. Bolt! quickly became the No. 1 app in Jamaica and climbed the UK iTunes charts to reach No. 2 on the list of Top Free Apps. Bolt's autobiography, My Story: 9.58: Being the World's Fastest Man, was released in 2010. Bolt had previously said that the book "...should be exciting, it's my life, and I'm a cool and exciting guy." His athletics agent is PACE Sports Management. As part of his sponsorship deal with Puma, the manufacturer sends sporting equipment to his alma mater, William Knibb Memorial High School, every year. At Bolt's insistence, advertisements featuring him are filmed in Jamaica, by a Jamaican production crew, in an attempt to boost local enterprise and gain exposure for the country. In 2017, Bolt had the third highest earning social media income for sponsors among sportspeople (behind Cristiano Ronaldo and Neymar), and he was the only non-footballer in the top seven. In 2009, at age 23, Usain Bolt became the youngest member so far of the Order of Jamaica. The award was "for outstanding performance in the field of athletics at the international level". In the Jamaican honours system, this is considered the equivalent of a knighthood in the British honours system, and entitles him to be formally styled "The Honourable", and to use the post nominal letters OJ. Bolt made a cameo appearance in the opening sketch of 13 October 2012 broadcast of Saturday Night Live, hosted by Christina Applegate. The segment was a parody of the Vice Presidential debate between Joe Biden and Paul Ryan. In the sketch, Taran Killam mimicking Ryan had just lied about running a 2:50 marathon, a sub-4-minute mile on no training and winning the 100 metres in London when Bolt was introduced as his partner to confirm. When Ryan asked Bolt "Who won the 100 metres?" the Jamaican gold-medallist answered simply. "I did." Ryan followed up by asking Bolt about his (Ryan's) finish. "You didn't finish. You weren't even there." On 23 November 2016, Bolt competed against James Corden in a rap battle on the "Drop the Mic" segment of The Late Late Show with James Corden, which he won. 100 metres 9.58 Berlin, Germany 16 August 2009 WR Also has the second fastest time (9.63) and shares the third fastest time of 9.69 with Tyson Gay and Yohan Blake. Bolt's 9.63 is the Olympic record, set at the 2012 games. 150 metres 14.35 Manchester, United Kingdom 17 May 2009 WB[note 2] He ran the last 100 m in 8.70, the fastest ever recorded time over a 100 m distance. This would equal an average speed of 41.38 km/h (25.71 mph). 200 metres 19.19 Berlin, Germany 20 August 2009 WR Also holds the Olympic record with 19.30, which was then (2008) a world record. 300 metres 30.97 Ostrava, Czech Republic 27 May 2010 NR This is the third fastest time, behind Wayde van Niekerk 30.81 & Michael Johnson 30.85A. The event is not recognised by the IAAF. 4 × 100 metres relay 36.84 London, England 11 August 2012 WR Shared with Yohan Blake, Michael Frater and Nesta Carter. Bolt's personal best of 9.58 seconds in 2009 in the 100 metres is the fastest ever run. Bolt also holds the second fastest time of 9.63 seconds, the current Olympic record, and set two previous world records in the event. Bolt's personal best of 19.19 s in the 200 metres is the world record. This was recorded at the 2009 World Championships in Athletics in Berlin against a headwind of −0.3 m/s. This performance broke his previous world record in the event, his 19.30 s clocking in winning the 2008 Olympic 200 metres title. Bolt has been on three world-record-setting Jamaican relay teams. The first record, 37.10 seconds, was set in winning gold at the 2008 Summer Olympics, although the result was voided in 2017 when the team was disqualified. The second record came at the 2011 World Championships in Athletics, a time of 37.04 seconds. The third world record was set at the 2012 Summer Olympics, a time of 36.84 seconds. Bolt also holds the 200 metres world teenage best results for the age categories 15 (20.58 s), 16 (20.13 s, world youth record), 17 (19.93 s) and 18 (19.93 s, world junior record). He also holds the 150 metres world best set in 2009, during which he ran the last 100 metres in 8.70 seconds, the quickest timed 100 metres ever. Bolt completed a total of 53 wind-legal sub-10-second performances in the 100 m during his career, with his first coming on 3 May 2008 and his last on 5 August 2017 at the World Championships. His longest undefeated streak in the 200 m was in 17 finals, lasting from 12 June 2008 to 3 September 2011. He also had a win-streak covering 14 100 m finals from 16 August 2008 to 16 July 2010. Bolt claimed 19 Guinness World Records, and, after Michael Phelps, holds second highest number of accumulative Guinness World Records for total number of accomplishments and victories in the sport. From his record time of 9.58 s for the 100 m sprint, Usain Bolt's average ground speed equates to 37.58 km/h (23.35 mph). However, once his reaction time of 0.148 s is subtracted, his time is 9.44 s, making his average speed 38.18 km/h (23.72 mph). Bolt's top speed, based on his split time of 1.61 s for the 20 metres from the 60- to 80-metre marks (made during the 9.58 WR at 100m), is 12.42 m/s (44.72 km/h (27.79 mph)). ^ Not a competition event. ^ a b This is not an official world record as the IAAF, the international athletics governing body, does not recognise the distance. ^ a b c d e f g h i j k l m n o Lawrence, Hubert; Samuels, Garfield (20 August 2007). "Focus on Jamaica – Usain Bolt". Focus on Athletes. International Association of Athletics Federations. Archived from the original on 4 June 2013. Retrieved 1 June 2008. ^ Thomas, Claire. "Built for speed: what makes Usain Bolt so fast?". telegraph.co.uk. Telegraph Media Group Limited. Archived from the original on 21 August 2016. Retrieved 20 August 2016. ^ "Usain BOLT". usainbolt.com. Archived from the original on 19 September 2015. Retrieved 29 September 2015. ^ Thomas, Claire (25 July 2016). "Glen Mills: the man behind Usain Bolt's record-shattering career". The Daily Telegraph. Retrieved 29 January 2019. ^ Wile, Rob (11 August 2017). "Usain Bolt Is Retiring. Here's How He Made Over $100 Million in 10 Years". Money. Retrieved 29 January 2019. ^ Clark, Nate (2 February 2019). "Usain Bolt having fun at Super Bowl, 'ties' NFL Combine 40-yard dash record". NBC. Retrieved 2 February 2019. ^ a b Clarey, Christopher (16 August 2009). Bolt Shatters 100-Meter World Record Archived 29 September 2015 at the Wayback Machine. The New York Times. Retrieved 16 August 2009. ^ a b "Bolt runs 14.35 sec for 150m; covers 50m-150m in 8.70 sec!". International Association of Athletics Federations. 17 May 2009. Archived from the original on 28 November 2013. Retrieved 28 November 2013. ^ a b Hart, Simon (20 August 2009). World Athletics: Usain Bolt breaks 200 metres world record in 19.19 seconds Archived 21 September 2016 at the Wayback Machine. The Daily Telegraph. Retrieved 21 August 2009. ^ a b c d e f g h "Usain Bolt IAAF profile". IAAF. Archived from the original on 18 August 2008. Retrieved 17 August 2008. ^ "Sports Illustrated". Sports Illustrated. Retrieved 25 February 2018. ^ Ellington, Barbara (31 August 2008). He is a happy person, says Usain's mother. Jamaica Gleaner. Retrieved 5 August 2009. ^ "Usain Bolt's Olympic goodbye the perfect ending for sprinting's greatest". The Guardian. 21 August 2016. Archived from the original on 4 September 2016. ^ "Bolt completes triple-triple, proves he's greatest sprinter of all time" (20 August 2016). The News & Observer. 31 August 2016. Archived from the original on 28 January 2017. ^ "Usain Bolt wins gold in his LAST Olympic race: He cements his legacy as the greatest sprinter in history as he makes it nine gold medals out of nine with 4x100m relay victory". Daily Mail. Archived from the original on 30 August 2016. Retrieved 31 August 2016. ^ "Usain Bolt is the best of all time says Michael Johnson". BBC. 31 August 2016. Archived from the original on 25 July 2016. ^ a b c "Usain Bolt scores twice on first start for Australia's Central Coast Mariners". BBC. 12 October 2018. Retrieved 13 October 2018. ^ Ferdinand, Rio (1 February 2009). "Local heroes: Usain Bolt Archived 28 January 2017 at the Wayback Machine". The Observer. Retrieved 3 February 2009. ^ Foster, Anthony (24 November 2008). "Bolt tops them again Archived 12 December 2013 at the Wayback Machine". Jamaica Gleaner. Retrieved 3 February 2009. ^ Helps, Horace (16 August 2008). "Bolt's gold down to yam power, father says". Reuters. Archived from the original on 18 September 2012. Retrieved 27 March 2011. ^ a b c d e f Layden, Tim (16 August 2008). "The Phenom". Sports Illustrated. Archived from the original on 20 August 2008. Retrieved 17 August 2008. ^ Sinclair, Glenroy (15 August 2008). "Bolts bonded". Jamaica Gleaner. Archived from the original on 24 August 2008. Retrieved 28 August 2008. ^ a b Longmore, Andrew (24 August 2008). "Brilliant Usain Bolt is on fast track to history". The Times. UK. Archived from the original on 15 August 2012. Retrieved 27 August 2008. ^ Frater, Adrian (5 August 2008). "Bolt's Sherwood on 'gold alert'". Jamaica Gleaner. Archived from the original on 14 August 2008. Retrieved 28 August 2008. ^ a b c d e Williams, Ollie (5 August 2008). "Ten to watch: Usain Bolt". BBC Sport. Archived from the original on 15 August 2012. Retrieved 18 August 2008. ^ a b c d Luton, Daraine (18 August 2008). "Pablo McNeil – the man who put the charge in Bolt". Jamaica Gleaner. Archived from the original on 26 August 2008. Retrieved 26 August 2008. ^ Foster, Anthony (17 March 2009). "Jarrett looking to produce some winners at Bolt's school". Jamaica Star. Archived from the original on 30 May 2013. Retrieved 6 August 2012. ^ a b "Carifta Games (Under 17 boys)". GBR Athletics. Archived from the original on 17 September 2008. Retrieved 17 August 2008. ^ "Official Results – 200 metres – Men – semi-final". IAAF. 14 July 2001. Archived from the original on 16 September 2008. Retrieved 17 August 2008. ^ "Central American and Caribbean Junior Championships". GBR Athletics. Archived from the original on 19 September 2008. Retrieved 17 August 2008. ^ "Official Results – 200 metres – Men – Final". IAAF. 19 July 2002. Archived from the original on 23 August 2008. Retrieved 17 August 2008. ^ "Official Results – 200 metres – Men – Heats". IAAF. 18 July 2002. Archived from the original on 27 July 2013. Retrieved 8 August 2010. ^ a b Longmore, Andrew (16 August 2008). "9.69 – and Usain Bolt didn't even try". The Times. UK. Archived from the original on 15 August 2012. Retrieved 17 August 2008. ^ Hattenstone, Simon (28 August 2010). Usain Bolt: Fast and loose Archived 24 April 2016 at the Wayback Machine. The Guardian. Retrieved 28 August 2010. ^ "Official Results – 4x100 metres – Men – Final". IAAF. 22 July 2002. Archived from the original on 10 March 2009. Retrieved 17 August 2008. ^ "4x400 metres – Men – Final". IAAF. 22 July 2002. Archived from the original on 31 March 2008. Retrieved 17 August 2008. ^ a b "Carifta Games Magazine, Part 2" (PDF). Carifta Games 2011. Archived from the original (PDF) on 25 April 2012. Retrieved 12 October 2011. ^ a b "Carifta Games Magazine, Part 3" (PDF). Carifta Games 2011. Archived from the original (PDF) on 25 April 2012. Retrieved 12 October 2011. 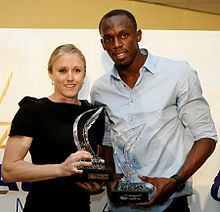 ^ "Bolt named outstanding athlete of 32nd Carifta Games". International Association of Athletics Federations. 23 April 2003. Archived from the original on 3 December 2013. Retrieved 28 November 2013. ^ "200 metres final results". IAAF. 23 July 2003. Archived from the original on 3 December 2013. Retrieved 28 November 2013. ^ a b c d Turnbull, Simon (17 August 2003). "Athletics: The boy they call Lightning is frightening". The Independent on Sunday. London. Archived from the original on 21 August 2009. Retrieved 25 August 2008. ^ a b c Powell, David (18 August 2008). "A closer look beyond Bolt and his 9.69". IAAF. Archived from the original on 3 December 2013. Retrieved 28 November 2013. ^ "U18 200 metres Outdoor". Iaaf.org. Archived from the original on 23 March 2017. Retrieved 22 March 2017. ^ "American Junior Outdoor Track & Field Records". USA Track and Field. 1 August 2008. Archived from the original on 22 September 2008. Retrieved 17 August 2008. ^ Kessel, Anna (24 August 2008). "Olympics: Jamaican speed freak". The Guardian. UK. Archived from the original on 2 October 2013. Retrieved 28 August 2008. ^ a b "Jamaica's Bolt on fast track to Olympics". Caribbean Net News. 21 April 2004. Archived from the original on 28 May 2008. Retrieved 26 August 2008. ^ Bolt leaves door open to 2017 sprint double at worlds Archived 19 September 2016 at the Wayback Machine. Retrieved on 14 September 2016. ^ "Bolt dashes to 19.93 – World Junior 200m record!". IAAF. 12 April 2004. Archived from the original on 15 August 2012. Retrieved 7 February 2012. ^ "Jamaica names Bolt, Fenton to Olympic athletics team". Caribbean Net News. 4 July 2004. Archived from the original on 26 May 2008. Retrieved 26 August 2008. ^ a b c d e f Rowbottom, Mike (4 August 2008). "Bolt from the blue". The Independent. UK. Archived from the original on 23 October 2012. Retrieved 12 August 2012. ^ Channer, Colin (9 August 2008). "'Cool Runnings' Are Heating Up". The Wall Street Journal. Archived from the original on 12 January 2015. Retrieved 18 August 2008. ^ Fordyce, Tom (10 December 2005). "I was in gutter, admits Chambers". BBC Sport. Archived from the original on 24 January 2007. Retrieved 25 August 2008. ^ Smith, Gary (12 July 2005). "No stopping Bolt as he blazes 20.03 at the CAC Championships". Caribbean Net News. Archived from the original on 22 August 2009. Retrieved 26 August 2008. ^ "Expect lightning from Bolt and a double from Campbell". Caribbean Net News. 29 June 2005. Archived from the original on 25 August 2009. Retrieved 26 August 2008. ^ "200 metres final". IAAF. 11 August 2005. Archived from the original on 3 December 2013. Retrieved 17 August 2008. ^ a b Smith, Gary (18 May 2006). "Bolt preparing to complete a full season, says manager". Caribbean Net News. Archived from the original on 25 May 2008. Retrieved 28 August 2008. ^ Butler, Mark et al. (2013). IAAF Statistics Book Moscow 2013 (archived), pp. 35–7. IAAF. Retrieved 6 July 2015. ^ a b c Smith, Gary (24 November 2005). "A cautious Bolt back on the track". Caribbean Net News. Archived from the original on 22 August 2009. Retrieved 26 August 2008. ^ Smith, Gary (21 November 2005). "Jamaica's Bolt recovers from motor vehicle accident". Caribbean Net News. Archived from the original on 22 August 2009. Retrieved 26 August 2008. ^ Cherry, Gene (23 July 2008). "Even Bolt's coach convinced of 100m pedigree". Caribbean News Net. Archived from the original on 22 August 2009. Retrieved 26 August 2008. ^ Smith, Gary (3 May 2006). "Bolt runs world leading 200m at Martinique Permit Meet". Caribbean Net News. Archived from the original on 26 May 2008. Retrieved 26 August 2008. ^ a b Smith, Gary (2 June 2006). "No sub-20, but Bolt optimistic about clash with Spearmon at Reebok Grand Prix". Caribbean Net News. Archived from the original on 26 May 2008. Retrieved 26 August 2008. ^ "Liu eclipses Jackson with 110m hurdles record". The Guardian. UK. 12 June 2006. Archived from the original on 30 August 2013. Retrieved 17 August 2008. ^ "World Cup in Athletics 2006 – Results 200 Metres Mens Final". IAAF. 17 September 2006. Archived from the original on 3 December 2013. Retrieved 28 November 2013. ^ "23rd Vardinoyiannia 2007 – 100Metres Mens Results". IAAF. 18 July 2007. Archived from the original on 3 December 2013. Retrieved 28 November 2013. 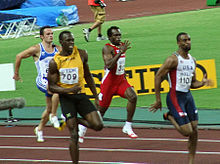 ^ "Osaka 2007 – 200 metres mens final". IAAF. 30 August 2007. Archived from the original on 16 September 2008. Retrieved 18 August 2008. ^ "Osaka 2007 – 4 × 100 Metres Relay – Mens Final". IAAF. 1 September 2007. Archived from the original on 15 September 2008. Retrieved 18 August 2008. ^ Tucker, Elton (5 May 2008). "'I didn't know I was going that fast' – Admits Bolt after rocketing to No. 2 on all-time 100m list with 9.76". Jamaica Gleaner. Archived from the original on 28 September 2008. Retrieved 6 September 2008. ^ Aikman, Richard (4 May 2008). "Lightning Bolt clocks second fastest ever 100m". The Guardian. UK. Archived from the original on 30 September 2013. Retrieved 18 August 2008. ^ a b Foster, Anthony (4 May 2008). "Bolt stuns with 9.76 dash in Kingston – Jamaica International report". IAAF. Archived from the original on 3 December 2013. Retrieved 28 November 2013. ^ Smith, Gary (7 May 2008). "American legend Johnson admits to being 'shocked' by Bolt run". Caribbean Net News. Archived from the original on 25 August 2009. Retrieved 26 August 2008. ^ Morse, Parker (1 June 2008). "Bolt 9.72 in New York! – World 100 metres record – IAAF World Athletics Tour". IAAF. Archived from the original on 3 December 2013. Retrieved 28 November 2013. ^ a b "Athletics: Cheats and liars cast cloud over Bolt's new 100m record". Irish Independent. 2 June 2008. Archived from the original on 15 August 2012. Retrieved 28 November 2013. ^ "Lightning Bolt to run first 200m of season". Agence France-Presse. 11 June 2008. Archived from the original on 26 February 2014. Retrieved 28 November 2013. ^ Nikitaridis, Michalis (14 July 2008). "Bolt runs 200m in 19.67sec in Athens – IAAF World Athletics Tour". IAAF. Archived from the original on 3 December 2013. Retrieved 28 November 2013. ^ Ramsak, Bob (12 June 2008). "Robles 12.87 World Record in Ostrava! – IAAF World Athletics Tour". IAAF. Archived from the original on 3 December 2013. Retrieved 28 November 2013. ^ Flynn, LeVaughan (3 June 2008). "Usain Bolt and Glen Mills: Long, winding journey to a world record". Sports Jamaica. Archived from the original on 5 December 2008. Retrieved 25 August 2008. ^ Turnbull, Simon (20 July 2008). "No Bolt from blue but he can be star of fast show". The Independent on Sunday. London. Archived from the original on 8 November 2012. Retrieved 25 August 2008. ^ Cyphers, Luke (11 August 2008). "Bolt may be 100 favourite, but Gay in better position to win". ESPN. Archived from the original on 17 August 2008. Retrieved 18 August 2008. ^ Gallagher, Brendan (6 August 2008). "Beijing Olympics: Usain Bolt set to run in both the 100 and 200 metres". The Daily Telegraph. UK. Archived from the original on 17 August 2008. Retrieved 18 August 2008. ^ Broadbent, Rick (14 August 2008). "Michael Johnson backs Usain Bolt to win sprint duel". The Times. UK. Archived from the original on 15 August 2012. Retrieved 18 August 2008. ^ "Beijing Olympics 2008 – Results 100 metres men's finals – Heats". IAAF. 15 August 2008. Archived from the original on 3 December 2013. Retrieved 28 November 2013. ^ "Beijing Olympics 2008 – Results 100 metres men's finals – Quarter finals". IAAF. 16 August 2008. Archived from the original on 28 November 2013. Retrieved 28 November 2013. ^ "Beijing Olympics 2008 – Results 100 metres men's finals – Semi-finals". IAAF. 16 August 2008. Archived from the original on 3 December 2013. Retrieved 28 November 2013. ^ a b c d "12th IAAF World Championships in Athletics: IAAF Statistics Handbook. Berlin 2009" (PDF). Monte Carlo: IAAF Media & Public Relations Department. 2009. p. 410. Archived from the original (PDF) on 6 August 2009. Retrieved 2 August 2009. ^ "Bolt surges to gold in new record". BBC Sport. 16 August 2008. Archived from the original on 28 August 2008. Retrieved 18 August 2008. ^ a b c d "100 Metres All Time". IAAF. 9 August 2008. Archived from the original on 9 June 2011. Retrieved 18 June 2011. ^ Zinser, Lynn (16 August 2008). "Bolt Is World's Fastest—by a Mile". The New York Times. Archived from the original on 6 July 2012. Retrieved 19 August 2008. ^ "Usain Bolt: 'Mission accomplished' in Beijing, next stop Zürich" (PDF). Weltklasse Zürich. Archived from the original (PDF) on 7 July 2011. Retrieved 26 August 2008. ^ Gullan, Scott (11 September 2008). "Scientists say Usain Bolt could have gone faster". Herald Sun. Archived from the original on 13 September 2008. Retrieved 10 September 2008. ^ Eriksen, H. K.; Kristiansen, J. R.; Langangen, Ø.; Wehus, I. K. (2009). "How fast could Usain Bolt have run? A dynamical study". American Journal of Physics. 77 (3): 224–228. arXiv:0809.0209. doi:10.1119/1.3033168. ^ Simon, Simon (17 August 2008). "Bolt of lightning leaves the rest of mankind far behind". The Independent. UK. Archived from the original on 20 August 2008. Retrieved 18 August 2008. ^ Akabusi, Kriss (19 August 2008). "Bolt's showboating is a slap for us idealists". The Guardian. UK. Archived from the original on 20 August 2008. Retrieved 19 August 2008. ^ "IOC Rips Bolt for Lack of 'Respect'". Associated Press. 21 August 2008. Archived from the original on 24 August 2008. Retrieved 21 August 2008. ^ Broadbent, Rick (21 August 2008). "Deluded Jacques Rogge fails to see the champion in Usain Bolt". The Times. UK. Archived from the original on 6 January 2009. Retrieved 21 August 2008. ^ Landells, Steve (16 August 2008). ""It was crazy, phenomenal" – Bolt's 9.69 100 metres stuns the Bird's Nest". IAAF. Archived from the original on 3 December 2013. Retrieved 28 November 2013. ^ "IAAF sides with Bolt on Rogge comments". The Washington Post. Associated Press. 23 August 2008. Archived from the original on 22 July 2011. Retrieved 26 August 2008. ^ Philips, Mitch (18 August 2008). "Bolt's bid for double safely under way". Reuters. Archived from the original on 20 October 2012. Retrieved 23 July 2011. ^ Johnson, Michael (20 August 2008). "Michael Johnson: I think my Olympic 200metres world record is safe from Usain Bolt – for now". The Daily Telegraph. UK. Archived from the original on 20 August 2008. Retrieved 20 August 2008. ^ "Jamaican Bolt second in 200 metres heat". BBC Sport. 18 August 2008. Archived from the original on 28 August 2008. Retrieved 18 August 2008. 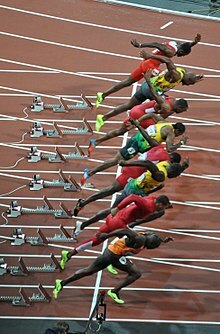 ^ "Super Bolt eases into 200 metres final". BBC Sport. 19 August 2008. Archived from the original on 28 August 2008. Retrieved 19 August 2008. ^ a b "Bolt claims 200m gold with record". BBC Sport. 20 August 2008. Archived from the original on 21 August 2008. Retrieved 20 August 2008. ^ "NEWS FLASH – Bolt does the double with 19.30 seconds WORLD RECORD!". IAAF. 20 August 2008. Archived from the original on 3 December 2013. Retrieved 28 November 2013. ^ "Bolt earns sprint double, breaks world record". Canadian Broadcasting Corporation. 20 August 2008. Archived from the original on 22 August 2008. Retrieved 20 August 2008. 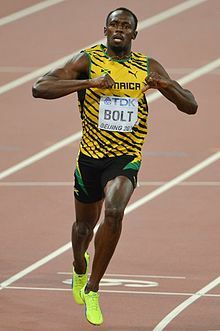 ^ a b "Bolt cements greatness, sets world record in 200 with 19.30". Sports Illustrated. 20 August 2008. Archived from the original on 24 August 2008. Retrieved 21 August 2008. ^ "Bolt grabs third gold and record". BBC Sport. 22 August 2008. Archived from the original on 28 August 2008. Retrieved 22 August 2008. ^ "NEWS FLASH – World 4x100m record, 37.10s – BOLT and JAMAICA again!". IAAF. 22 August 2008. Archived from the original on 22 August 2008. Retrieved 22 August 2008. ^ "Jamaica smashes WR in men's relay". ABC. 22 August 2008. Archived from the original on 15 September 2008. Retrieved 22 August 2008. ^ "Usain Bolt stripped of 2008 Olympic relay gold after Nesta Carter fails drug test". The Guardian. 25 January 2017. Archived from the original on 25 January 2017. Retrieved 25 January 2017. ^ ""Lightning" Bolt donates for children in China's quake zone". China Daily. 23 August 2008. Archived from the original on 29 September 2009. Retrieved 25 August 2008. ^ Steve, Nearman (25 August 2008). "Bolt not done yet". The Washington Times. Archived from the original on 30 December 2008. Retrieved 27 August 2008. ^ "Bolt's heroics arrive just in time". Reuters. 25 August 2008. Archived from the original on 3 December 2013. Retrieved 28 November 2013. ^ Fordyce, Tom (24 February 2004). "The THG scandal explained". BBC Sport. Archived from the original on 15 March 2006. Retrieved 27 August 2008. ^ "Johnson dismisses sabotage claims". BBC Sport. 31 July 2006. Archived from the original on 15 August 2012. Retrieved 27 August 2008. ^ "Jones returns five medals from 2000 Sydney Olympics". ESPN. 8 October 2007. Archived from the original on 26 September 2008. Retrieved 27 August 2008. ^ Maese, Rick (24 August 2008). "A cleaner Olympics? Despite drug test numbers, don't count on it". Los Angeles Times. Archived from the original on 27 August 2008. Retrieved 27 August 2008. ^ Conte, Victor (18 August 2008). "Conte: World Anti-Doping Agency needs to beef up offseason steroid testing". Daily News. New York. Archived from the original on 26 August 2008. Retrieved 27 August 2008. ^ Broadbent, Rick (18 August 2008). "Usain Bolt: a Jamaican miracle". The Times. UK. Archived from the original on 15 August 2012. Retrieved 27 August 2008. ^ Flynn, LeVaughn (3 June 2008). "Usain Bolt and Glen Mills: Long, winding journey to a world record". Jamaica Gleaner. Archived from the original on 17 September 2008. Retrieved 27 August 2008. ^ "Bolt ok with tests". Jamaica Gleaner. 27 August 2008. Archived from the original on 29 August 2008. Retrieved 27 August 2008. 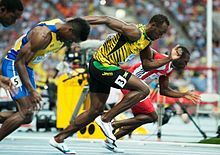 ^ Bolt, Usain (2010). Usain Bolt 9.58. London: HarperCollins. p. 127. ISBN 978-0-00-737139-6. ^ a b Turnbull, Simon (30 August 2008). "No fireworks, or lightning, but Bolt eases to another triumph". The Independent. UK. Archived from the original on 6 October 2008. Retrieved 31 August 2008. ^ Sampaolo, Diego (2 September 2008). "Powell improves to 9.72, Bolt dashes 19.63 in Lausanne – IAAF World Athletics Tour". IAAF. Archived from the original on 3 December 2013. Retrieved 28 November 2013. ^ Phillips, Michael (3 September 2008). "Powell threatens Bolt's 100m record". The Guardian. UK. Archived from the original on 30 September 2013. Retrieved 6 September 2008. ^ Turnbull, Simon (6 September 2008). "Bolt win rounds off a golden summer". The Independent. UK. Archived from the original on 2 December 2008. Retrieved 6 September 2008. ^ "Welcoming home our Olympians". Jamaica Gleaner. 5 October 2008. Archived from the original on 7 May 2009. Retrieved 20 October 2008. ^ "Bolt wins Laureus World Sportsman Award for third time". Laureus. 19 August 2016. Archived from the original on 21 August 2016. ^ "Bolt and Isinbayeva are World Athletes of the Year – 2008 World Athletics Gala". IAAF. 23 November 2008. Archived from the original on 3 December 2013. Retrieved 28 November 2013. ^ "Bolt sets sights on 400m record". BBC Sport. 15 December 2008. Archived from the original on 16 December 2008. Retrieved 16 December 2008. ^ Bolt maintains improvement over longer sprint Archived 25 February 2009 at the Wayback Machine. Reuters (22 February 2009). Retrieved 16 May 2009. ^ Clare, Nelson (15 March 2009), "Usain Bolt makes a winning start on his return to 100m action" Archived 21 September 2016 at the Wayback Machine, The Independent. Retrieved 16 May 2009. ^ "Bolt Manchester date is still on". International Association of Athletics Federations. 12 May 2009. Archived from the original on 3 December 2013. Retrieved 28 November 2013. ^ "Bolt 9.86 and Fraser 10.88; Walker and Phillips excel over hurdles – JAM Champs, Day 2". International Association of Athletics Federations. 28 June 2009. Archived from the original on 3 December 2013. Retrieved 28 November 2013. ^ "Bolt completes double; 'Not 100%' Veronica Campbell-Brown runs 22.40 – JAM Champs, Day 3". International Association of Athletics Federations. 29 June 2009. Archived from the original on 3 December 2013. Retrieved 28 November 2013. ^ Bolt rules out threat to record. BBC Sport (28 June 2009). Retrieved 29 June 2009. ^ "Despite the rain, Bolt blasts 19.59sec in Lausanne – IAAF World Athletics Tour". International Association of Athletics Federations. 7 July 2009. Archived from the original on 3 December 2013. Retrieved 28 November 2013. ^ "Bolt storms to stunning victory". BBC Sport. 7 July 2009. Archived from the original on 8 July 2009. Retrieved 7 July 2009. ^ Ramsak, Bob (16 August 2009). Event Report – Men's 100m – Semi-Final Archived 19 August 2009 at the Wayback Machine. IAAF. Retrieved 16 August 2009. ^ Ramsak, Bob (16 August 2009). Event Report – Men's 100m – Final Archived 20 August 2009 at the Wayback Machine. IAAF. Retrieved 16 August 2009. ^ Farhi, Paul (21 August 2009). "Jamaican Sprinters Such as Usain Bolt Quickly Reshape Nation's Identity". The Washington Post. Archived from the original on 1 April 2012. Retrieved 23 August 2009. ^ Mulkeen, Jon (20 August 2009). Event Report – Men's 200m – Final Archived 22 August 2009 at the Wayback Machine. IAAF. Retrieved 21 August 2009. ^ Wallace Spearmon Earns Bronze In 200 As Three Others Advance To World Champ Finals Archived 24 October 2013 at the Wayback Machine. KBTX (20 August 2009). Retrieved 21 August 2009. ^ "Awesome Bolt breaks 200m record". BBC Sport. 20 August 2009. Archived from the original on 21 August 2009. Retrieved 20 August 2009. ^ 100 Metres – M Final Archived 27 July 2013 at the Wayback Machine. IAAF (20 August 2009). Retrieved 21 August 2009. ^ Kessel, Anna (20 August 2009). 'I aim to become a legend,' says Usain Bolt as he smashes 200m world record Archived 27 September 2016 at the Wayback Machine. The Guardian. Retrieved 21 August 2009. ^ Men's 200m Final 2008 Olympics Archived 3 November 2009 at the Wayback Machine. NBC (20 August 2009). Retrieved 21 August 2009. ^ Men's 100m Final 2008 Olympics Archived 3 November 2009 at the Wayback Machine. NBC (20 August 2009). Retrieved 21 August 2009. ^ "Jamaica dominates the 400 meter relays". trackalerts.com. 22 August 2009. Archived from the original on 29 August 2009. Retrieved 14 February 2010. ^ "Grateful Usain Bolt given 3-ton piece of Berlin Wall". ESPN. 23 August 2009. Archived from the original on 27 August 2009. ^ "Bolt's Berlin Wall unveiled ... two-ton gift at Up Park Camp". The Gleaner. 11 February 2010. Archived from the original on 14 April 2016. ^ "Powell: Bolt could beat long jump WR". Reuters. 21 August 2009. ^ "Bolt and Richards are World Athletes of the Year – 2009 World Athletics Gala". International Association of Athletics Federations. 22 November 2009. Archived from the original on 3 December 2013. Retrieved 28 November 2013. ^ "Bolt sizzles 19.56 in 200m opener in Kingston". International Association of Athletics Federations. 2 May 2010. Archived from the original on 3 December 2013. Retrieved 28 November 2013. ^ "Dominant Usain Bolt wins season opener in South Korea". BBC News. 19 May 2010. Archived from the original on 15 August 2012. Retrieved 18 May 2014. ^ Broadbent, Rick (24 May 2010). Usain Bolt cool on records after sparkling Diamond League debut Archived 1 June 2010 at the Wayback Machine. The Times. Retrieved 8 August 2010. ^ Hart, Simon (8 July 2010). Usain Bolt urged by doctors to stick with 100m until injury worries clear Archived 11 October 2016 at the Wayback Machine. The Daily Telegraph. Retrieved 8 August 2010. ^ Hart, Simon (27 May 2010). Usain Bolt falls just short of 300 m world record at Golden Spike meeting in Ostrava Archived 11 October 2016 at the Wayback Machine. The Daily Telegraph. Retrieved 8 August 2010. ^ Bolt beats Blake, Martina Archived 15 January 2016 at the Wayback Machine. ESPN (8 July 2010). Retrieved 8 August 2010. ^ Bolt beats rival Powell in Paris Diamond League 100m. BBC Sport (16 July 2010). Retrieved 8 August 2010. ^ Tyson Gay beats Usain Bolt over 100 m for first time. BBC Sport (6 August 2010). Retrieved 8 August 2010. ^ "Stockholm packs in tight to see Gay finish well clear of Bolt, 9.84–9.97 – REPORT – Samsung Diamond League". International Association of Athletics Federations. 6 August 2010. Archived from the original on 3 December 2013. Retrieved 28 November 2013. ^ a b c senior outdoor 2011 100 Metres men Archived 1 November 2016 at the Wayback Machine. IAAF. Retrieved on 10 August 2016. ^ Rowbottom, Mike (4 January 2012). 2011 Samsung Diamond League REVIEW – Part 1 Archived 23 June 2013 at the Wayback Machine. IAAF. Retrieved on 10 August 2016. ^ "Usain Bolt false starts, eliminated in final". ESPN. 28 August 2011. Archived from the original on 3 March 2016. ^ World Athletics 2011: Bolt disqualified as Blake wins gold Archived 10 May 2016 at the Wayback Machine. BBC Sport. Retrieved on 10 August 2016. ^ "Bolt claims 200 m gold in Daegu with dominant run". CNN. 3 September 2011. Archived from the original on 2 April 2012. Retrieved 3 September 2011. ^ Johnson, Len (3 September 2011). Men's 200m – Final – Bolt blasts to 19.40 victory Archived 10 August 2016 at the Wayback Machine. IAAF. Retrieved on 10 August 2016. ^ Johnson, Len (4 September 2011). Men's 4x100m Relay – Final – 37.04 World record for Jamaica! Archived 10 August 2016 at the Wayback Machine. IAAF. Retrieved on 10 August 2016. ^ Rowbottom, Mike (16 September 2011). Blake upstages the world in Brussels – REPORT – Samsung Diamond League, FINAL Archived 10 August 2016 at the Wayback Machine. IAAF. Retrieved on 10 August 2016. ^ senior outdoor 2011 200 Metres men Archived 10 August 2016 at the Wayback Machine. IAAF. Retrieved on 10 August 2016. ^ Bolt's 9.82 100m season's debut one of four world leading performances in Kingston – IAAF World Challenge Archived 10 August 2016 at the Wayback Machine. IAAF (6 May 2012). Retrieved on 10 August 2016. ^ "Usain Bolt pips Asafa Powell in Diamond League 100m". 8 June 2012. Archived from the original on 8 June 2012. ^ More upsets in Kingston – Blake defeats Bolt at 200m, Fraser-Pryce a double winner – Jamaican Olympic Trials, Day 4 Archived 10 August 2016 at the Wayback Machine. IAAF (2 July 2012). Retrieved on 10 August 2016. ^ Blake defeats Bolt with sizzling 9.75, Fraser-Pryce dazzles with 10.70 national record in Kingston – Jamaican Olympic Trials, Day 2 Archived 10 August 2016 at the Wayback Machine. IAAF (30 June 2012). Retrieved on 10 August 2016. ^ Lopresti, Mike (6 August 2012) Usain Bolt Builds Cult of Personality 9.63 Seconds at a Time Archived 10 March 2016 at the Wayback Machine. USA Today. ^ Kessel, Anna (5 August 2012). "Usain Bolt takes 100 m Olympic gold – this time even faster | Sport". The Guardian. London. Archived from the original on 7 January 2014. Retrieved 6 August 2012. ^ "Bolt Completes Historic Double with Gold in 200 m". CTV Olympics. 9 August 2012. Archived from the original on 9 August 2012. Retrieved 9 June 2012. ^ "Usain Bolt wins 200m Olympic gold to seal unique sprint double". The Times of India. Archived from the original on 9 August 2012. Retrieved 10 August 2012. ^ "Jamaica shatters world record in 4X100m relays". Jamaica Observer. 11 August 2012. Archived from the original on 13 August 2012. Retrieved 11 August 2012. ^ Wilson, Stephen (9 August 2012). "Rogge: Usain Bolt not a 'legend' yet". Yahoo!. Associated Press. Archived from the original on 14 March 2013. Retrieved 13 August 2012. ^ "IOC chief: Bolt is active performance legend". Sports Inquirer. Associated Press. 12 August 2012. Archived from the original on 14 August 2012. Retrieved 13 August 2012. ^ Badenhausen, Kurt (4 August 2012). "How Usain Bolt Earns $20 Million A Year". Forbes. Archived from the original on 8 August 2012. Retrieved 10 August 2012. ^ senior outdoor 2012 100 Metres men Archived 10 August 2016 at the Wayback Machine. IAAF. Retrieved on 10 August 2016. ^ senior outdoor 2012 200 Metres men Archived 10 August 2016 at the Wayback Machine. IAAF. Retrieved on 10 August 2016. ^ Julin, A. Lennart (29 December 2012). 2012 – End of Year Reviews – Sprints Archived 10 August 2016 at the Wayback Machine. IAAF. Retrieved on 10 August 2016. ^ "Justin Gatlin edges Usain Bolt in 100". ESPN. Archived from the original on 9 June 2013. Retrieved 7 June 2013. ^ Minshull, Phil (6 June 2013). Gatlin upsets Bolt, Ahoure surprises Felix in Rome – IAAF Diamond League. IAAF. Retrieved on 10 August 2016. ^ Bolt books place on Jamaican team with national 100m win Archived 11 March 2016 at the Wayback Machine. IAAF (22 June 2013). Retrieved on 10 August 2016. ^ Fraser-Pryce world-leading 22.13, Weir 19.79 on final day of the Jamaican Champs Archived 10 August 2016 at the Wayback Machine. IAAF (24 June 2013). Retrieved on 10 August 2016. ^ senior outdoor 2013 100 Metres men Archived 19 January 2013 at the Wayback Machine. IAAF. Retrieved on 10 August 2016. ^ senior outdoor 2013 200 Metres men Archived 10 August 2016 at the Wayback Machine. IAAF. Retrieved on 10 August 2016. ^ "Usain Bolt regains 100-meter gold at worlds". Associated Press. Archived from the original on 15 August 2012. Retrieved 12 August 2013. ^ "100 Metres Result – 14th IAAF World Championships". iaaf.org. Archived from the original on 27 August 2017. Retrieved 18 May 2014. ^ Johnson, Len (11 August 2013). Report: Men's 100m final – Moscow 2013 Archived 27 November 2015 at the Wayback Machine. IAAF. Retrieved on 10 August 2016. ^ "Usain Bolt Wins Men's 200 Meters at Worlds". ABC News. Archived from the original on 18 August 2013. Retrieved 17 August 2013. ^ Lightning Bolt strikes three times in 200m Archived 26 August 2013 at the Wayback Machine. IAAF (18 August 2013). Retrieved on 10 August 2016. ^ a b "Jamaica Sweeps 6 Sprint Events With Relay Golds". Associated Press. Archived from the original on 22 August 2016. Retrieved 18 August 2013. ^ Jalava, Mirko (18 August 2013). Report: Men's 4x100m Relay final – Moscow 2013 Archived 21 March 2016 at the Wayback Machine. IAAF. Retrieved on 10 August 2016. ^ Jalava, Mirko (2 January 2014). 2013 end-of-year reviews – sprints Archived 21 March 2016 at the Wayback Machine. IAAF. Retrieved on 10 August 2016. ^ Bolt and Fraser-Pryce are crowned 2013 World Athletes of the Year Archived 29 November 2016 at the Wayback Machine. IAAF (16 November 2013). Retrieved on 10 August 2016. ^ Ralston, Gary (23 July 2014). "Glasgow 2014: Usain Bolt set for Commonwealth Games debut in Scotland & admits he couldn't disappoint his fans". Daily Record. Archived from the original on 2 June 2015. Retrieved 23 June 2015. ^ Fordyce, Tom (2 August 2014) Usain Bolt: Glasgow 2014 gold for Jamaica in 4x100m relay. BBC Sport. Retrieved on 10 August 2016. ^ Smith, R. Cory. "Usain Bolt Sets World Indoor 100-Meter Record in Warsaw National Stadium". Bleacher Report. Archived from the original on 26 June 2015. Retrieved 23 June 2015. ^ a b Senior outdoor 2014 100 Metres men. IAAF. ^ "Usain Bolt ends his season by withdrawing from Zurich competition | Sport". The Guardian. Press Association. Archived from the original on 16 August 2015. Retrieved 23 June 2015. ^ Senior outdoor 2014 200 Metres men. IAAF. ^ "Usain Bolt to retire after 2017 Worlds Championships in London". BBC Sport. 14 February 2015. Archived from the original on 16 February 2015. Retrieved 14 February 2015. ^ a b Senior outdoor 2015 200 Metres men Archived 20 March 2016 at the Wayback Machine. IAAF. Retrieved on 10 August 2016. ^ a b senior outdoor 2015 100 Metres men Archived 27 December 2016 at the Wayback Machine. IAAF. Retrieved on 10 August 2016. ^ Johnson, Len (20 August 2015). Preview: men's 100m – IAAF World Championships, Beijing 2015 Archived 10 August 2016 at the Wayback Machine. IAAF. Retrieved on 10 August 2016. ^ Jalava, Mirko (31 December 2015). 2015 end-of-year reviews – sprints Archived 10 August 2016 at the Wayback Machine. IAAF. Retrieved on 10 August 2016. ^ "100 Metres men- – 15th IAAF World Championships". IAAF. Archived from the original on 23 August 2015. ^ "Usain Bolt beats Justin Gatlin by one hundredth of a second in 100m World Championship final". The Daily Telegraph. 23 August 2015. Archived from the original on 23 August 2015. Retrieved 24 August 2015. ^ Johnson, Len (23 August 2015). Report: men's 100m final – IAAF World Championships, Beijing 2015 Archived 27 December 2016 at the Wayback Machine. IAAF. Retrieved on 10 August 2016. ^ Jalava, Mirko (27 August 2015). Report: men's 200m final – IAAF World Championships, Beijing 2015 Archived 27 December 2016 at the Wayback Machine. IAAF. Retrieved on 10 August 2016. ^ Landells, Steve (29 August 2015). Report: men's 4x100m final – IAAF World Championships, Beijing 2015 Archived 27 December 2016 at the Wayback Machine. IAAF. Retrieved on 10 August 2016. ^ Usain Bolt ends season early and will miss Diamond League final Archived 17 August 2016 at the Wayback Machine. BBC Sport (7 September 2015). Retrieved on 10 August 2016. ^ senior outdoor 2016 100 Metres men Archived 1 December 2016 at the Wayback Machine. IAAF. Retrieved on 10 August 2016. ^ senior outdoor 2016 200 Metres men Archived 21 December 2016 at the Wayback Machine. IAAF. Retrieved on 10 August 2016. ^ Brown, Mick (15 July 2016). Usain Bolt on doping and marriage: 'Girls are throwing themselves at you... it's hard to say no' Archived 16 July 2016 at the Wayback Machine. Daily Telegraph. Retrieved on 10 August 2016. ^ Roan, Dan (16 August 2016). "Rio Olympics 2016: Usain Bolt wants to be among greats Muhammad Ali & Pele" (9 August 2016). BBC. Archived from the original on 12 August 2016. ^ a b "Rio Olympics 2016: Usain Bolt wins 100m gold, Justin Gatlin second". BBC. 16 August 2016. Archived from the original on 16 August 2016. ^ "How Usain Bolt won his third consecutive Olympic gold in the 200m". The Guardian. 19 August 2016. Archived from the original on 15 December 2016. ^ a b "Usain Bolt leads Jamaica to 4x100m gold to complete Olympic triple-treble". The Guardian. 19 August 2016. Archived from the original on 29 November 2016. ^ Mather, Victor (25 January 2017). "Usain Bolt and Jamaica Stripped of 2008 Olympic Relay Gold Medal". The New York Times. ISSN 0362-4331. Archived from the original on 25 January 2017. Retrieved 25 January 2017. ^ Nitro goes off with a bang, returning crowds to athletics Archived 15 August 2012 at the Wayback Machine. The Australian (13 February 2017). Retrieved on 13 February 2017. ^ Rolfe, Peter (8 February 2017). Nitro Athletics stays in Melbourne until at least 2019 Archived 15 August 2012 at the Wayback Machine. Herald Sun. Retrieved on 13 February 2017. ^ "Usain Bolt loses one Olympic gold medal as Nesta Carter tests positive". BBC News. 25 January 2017. Archived from the original on 25 January 2017. Retrieved 25 January 2017. ^ "Bolt finale ends in injury and collapse, no gold". ESPN.com. Archived from the original on 13 August 2017. Retrieved 13 August 2017. ^ Aitkenhead, Decxca (12 November 2016). "Usain Bolt: 'I feel good because I know I've done it clean'". The Guardian. Archived from the original on 11 February 2017. Retrieved 15 February 2017. ^ "Usain Bolt trains with Norwegian top-flight side Stromsgodset". BBC Sport. 30 May 2018. Retrieved 5 June 2018. ^ "Camisa "9.58", Bolt estreia no futebol norueguês com direito a gol perdido" (in Portuguese). Globo.com. 5 June 2018. Retrieved 5 June 2018. ^ "Usain Bolt to finally make Old Trafford debut". BBC News. 27 February 2018. Retrieved 8 September 2018. ^ "Must See". BBC News. Retrieved 21 August 2018. ^ "Lá vem o Raio! Usain Bolt faz sua estreia como jogador de futebol na Austrália". Globoesporte (in Portuguese). Retrieved 8 September 2018. ^ "Usain Bolt Strikes His Signature Pose Celebrating First Goals In Pro Soccer". Huffington Post. Retrieved 18 October 2018. ^ Wenzel, Murray (21 October 2018). "Usain Bolt offered contract by Central Coast Mariners, agent confirms". The Sydney Morning Herald. Retrieved 21 October 2018. ^ "Usain Bolt leaves Australian football club". BBC News. 2 November 2018. ^ Fiore, Tommaso (22 January 2019). "Usain Bolt gives up on his hopes as a professional football player". Sky Sports. Retrieved 23 January 2019. ^ Fletcher, Damian; Armstrong, Jeremy (18 August 2008). "Olympic 100m hero Usain Bolt powered by chicken nuggets and yams". Daily Mirror. UK. Archived from the original on 21 November 2008. Retrieved 18 August 2008. ^ Kerr, David (31 August 2012). "Vatican invites Usain Bolt to address religious liberty conference". Catholic News Agency. Archived from the original on 8 December 2012. Retrieved 4 December 2012. ^ "Usain Bolt turns DJ in Paris". The Daily Telegraph. London. 16 July 2010. Archived from the original on 18 July 2010. ^ "Usain Bolt hooked on Call of Duty but remains anonymous to opponents". Daily Telegraph. 16 August 2016. Archived from the original on 20 September 2016. 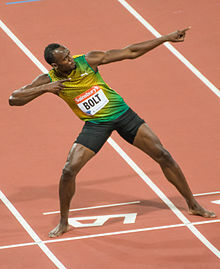 ^ What's the origin of Usain Bolt's signature celebration?. USA Today (14 August 2016). Retrieved 1 May 2018. ^ Usain Bolt reviews babies' attempts at his trademark lightning bolt pose. Daily Telegraph (19 January 2015). Retrieved 1 May 2018. ^ Catching up with Bernard ‘Hollywood’ Williams. NBC Sports (7 April 2014). Retrieved 1 May 2018. ^ Mountford, Adam (8 February 2009). "Windies triumph delights Bolt". BBC Sport. Archived from the original on 10 February 2009. Retrieved 9 February 2009. ^ "Usain Bolt likes to watch Sachin, Gayle". MSN. 22 August 2008. Archived from the original on 22 August 2008. Retrieved 23 August 2008. ^ "Usain Bolt gives respect to cricketer Matthew Hayden". Herald Sun. 22 August 2008. Archived from the original on 24 August 2008. Retrieved 25 August 2008. ^ "Gayle returns as Windies skipper". BBC News. 2 November 2009. Archived from the original on 15 August 2012. ^ "Lightning Bolt blows over Gayle". BBC News. 19 October 2009. Archived from the original on 5 August 2017. ^ "Usain Bolt to play for Melbourne Stars in Big Bash League?". cricketcountry.com. 12 August 2012. Archived from the original on 14 August 2012. Retrieved 12 August 2012. ^ "Shane Warne leading campaign to bring Usain Bolt to Melbourne for Australia's Twenty20 Big Bash League". The Daily Telegraph. London. 13 August 2012. Archived from the original on 21 August 2012. Retrieved 21 August 2012. ^ a b "Lightning Bolt strikes Paris". Radio France Internationale. Archived from the original on 3 March 2012. Retrieved 18 February 2012. ^ "Usain Bolt: I could play for Man Utd when I retire". ESPN Soccernet. 9 June 2011. Archived from the original on 12 June 2011. Retrieved 18 February 2012. ^ Rieken, Kristie (15 February 2013). "Usain Bolt hits the hardwood at NBA all-star weekend". The Globe and Mail. Toronto. Archived from the original on 17 February 2013. Retrieved 18 February 2013. ^ "I Am Bolt (2016)". IMdb. Archived from the original on 12 February 2017. Retrieved 11 March 2017. ^ "I Am Bolt review – life in the fast lane". The Guardian. 27 November 2016. Archived from the original on 10 March 2017. ^ "PUMA's Usain Bolt breaks 100m World Record". Puma. 3 June 2008. Archived from the original on 1 August 2008. Retrieved 18 August 2008. ^ "Puma running – Chasing Bolt". Puma. Archived from the original on 28 April 2010. Retrieved 18 August 2008. ^ Rowbottom, Mike (2 June 2008). "'Lightning' Bolt storms to record in 100 metres". The Independent. UK. Archived from the original on 5 June 2008. Retrieved 20 August 2008. ^ "Lightning Bolt's Irish connection". BBC Sport. 20 August 2008. Archived from the original on 28 August 2008. Retrieved 20 August 2008. ^ "Lightning Bolt makes giant leap". Evening Herald. 18 August 2008. Archived from the original on 15 August 2012. Retrieved 20 August 2008. ^ "Allon Sinai's Olympic Diary: A Bolt from the blue strikes the Nest". The Jerusalem Post. 17 August 2008. Archived from the original on 4 December 2013. Retrieved 28 November 2008. ^ Weiner, Jay (16 August 2008). "Usain Bolt blazes to top of 100-metre lore". Sporting News. Archived from the original on 19 August 2008. Retrieved 18 August 2008. ^ "Wallaby winger Lachie Turner named footy's fastest man after 100m race". Daily Telegraph. 16 August 2016. Archived from the original on 15 August 2012. ^ Sweney, Mark (13 January 2012). "Usain Bolt mimics Richard Branson in Virgin Media superfast broadband ad". The Guardian. London. Archived from the original on 5 December 2013. Retrieved 16 February 2012. ^ Levy, Leighton (20 March 2012). "Bolt Stars in Visa Ad". The Gleaner. Archived from the original on 22 March 2012. Retrieved 1 April 2012. ^ "Can Usain Bolt Create an Olympic-Sized Brand?". Archived from the original on 23 July 2012. ^ Athlete Profile Usain Bolt Archived 3 December 2013 at the Wayback Machine. PACE Sports Management. Retrieved 12 May 2009. ^ Thomas, Claire. "10 facts you didn't know about Usain Bolt, the world's fastest man". The Telegraph. Retrieved 27 August 2017. ^ "Usain Bolt wins IAAF World Athlete of the Year award for a record sixth time". BBC Sport. 2 December 2016. Archived from the original on 3 December 2016. Retrieved 2 December 2016. ^ "Fastest man on Earth Usain Bolt wins Laureus World Sportsman of the Year Award". Archived from the original on 27 August 2009. Retrieved 6 November 2009. ^ "2010 Laureus World Sports Awards Winners are Announced". Archived from the original on 14 March 2010. Retrieved 10 March 2010. 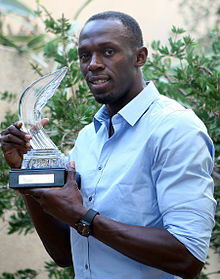 ^ "Usain Bolt, Jessica Ennis win top Laureus awards". The Australian. 12 March 2013. Archived from the original on 15 May 2013. ^ "Welcoming home our Olympians Archived 12 December 2013 at the Wayback Machine", The Jamaica Gleaner, 5 October 2008. ^ a b National Awards of Jamaica Archived 26 January 2013 at the Wayback Machine Official Jamaican Government website. "So far, the youngest member is Ambassador the Hon. Usain Bolt. He was awarded at age 23 for outstanding performance in the field of athletics at the international level." ^ "World's fastest man Bolt gets Order of Jamaica Archived 20 February 2013 at the Wayback Machine", Associated Press, 19 October 2009. ^ "103 for national awards Archived 16 June 2012 at the Wayback Machine", The Jamaica Gleaner, 6 August 2009. ^ "A juicy award for embattled Denis O'Brien". Irish Times. 16 August 2016. Archived from the original on 25 September 2016. ^ Epstein, David (13 October 2012). "SNL: Bolt adds jolt to Ryan-Biden VP debate; Christina Applegate hosts – Obnoxious Boston Fan". Boston Globe. Archived from the original on 6 November 2012. Retrieved 10 November 2012. ^ "100 Metres All Time". IAAF. 5 August 2012. Archived from the original on 12 August 2012. Retrieved 14 August 2012. ^ "4x100 Metres Relay All Time". IAAF. 22 August 2008. Archived from the original on 20 October 2012. Retrieved 14 August 2012. ^ Usain Bolt. Tilastopaja. Retrieved 1 May 2018. ^ "Guinness World Records online registry"
the result of the linked search will display higher number of records, however many of those displayed contain the name of Usain Bolt in the description of the record but don't belong to him". Guinness World Records. Retrieved 15 March 2018. ^ "IAAF World Championships – Berlin 2009 – 100 Metres Men Final". Berlin.iaaf.org. Archived from the original on 15 August 2012. Retrieved 10 November 2012. 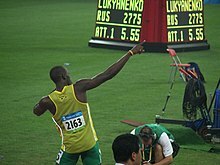 Wikimedia Commons has media related to Usain Bolt.